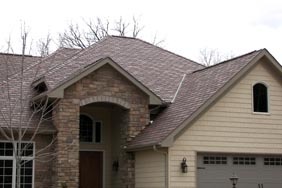 Titan Slate is designed to achieve the classic architectural look of slate roofing. It is manufactured from recycled products. Titan’s Slate composite roofing product has passed stringent testing to meet Class A or C fire rating, and an impact rating of Class 4, the highest in the industry for hail resistance. Titan Slate is easier to install than natural slate resulting in lower installation costs; and it is lighter in weight thus eliminating the need for costly additional structural support which is needed for a natural slate roof. Titan Slate roofnig can be installed at two different exposures allowing for a choice in the look you want. It can also be installed in a staggered application. Exposure 7.5" 6.5" 7.5" 6.5"
Height 18" ± ⅛" 18" ± ⅛" 18" ± ⅛" 18" ± ⅛"
Width 12 ⅛" ± ⅛" 12 ⅛" ± ⅛" 12 ⅛" ± ⅛" 12 ⅛" ± ⅛"
For Architects | For Developers | For Homeowners | Home | About Us | Catalog | Contact | Site Map | Roof Tile | Commercial Roofing | Residential Roofing | Recycled Roofing | Green Roof | White Roof | FAQS | © 2007 Titan MFG Roof Systems. All rights reserved.